I am excited to announce the kick off event for TransPAC on Wednesday, May 11th! 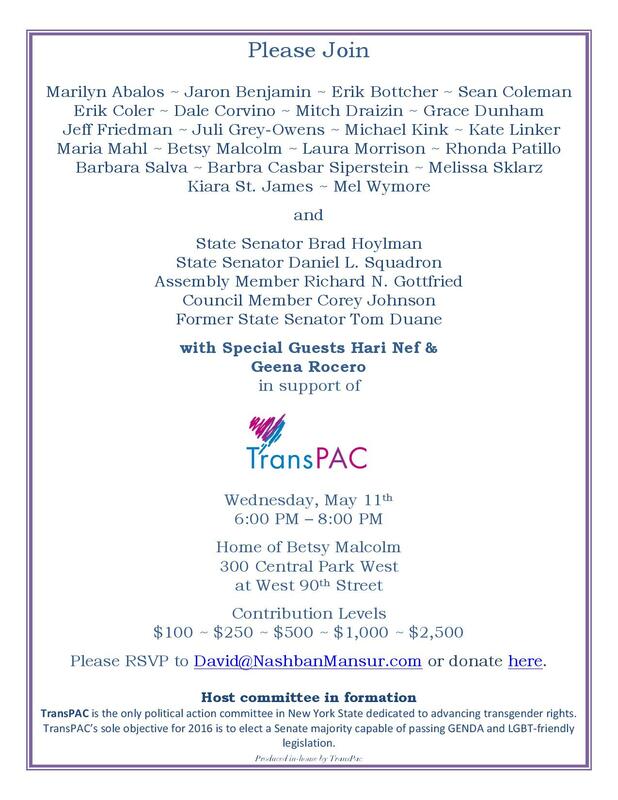 TransPAC is the only political action committee (PAC) dedicated to advancing the rights of transgender people in New York State. In 2016, our priority is supporting Democratic NYS Senate candidates, with the aim of achieving a Democratic majority able to pass GENDA, the Gender Expression Non-Discrimination Act. On Wednesday, May 11th starting at 6 pm, we will be joined by special guest Hari Nef from the Emmy winning show Transparent, Geena Rocero a model, TED talker, and founder of Gender Proud, as well as State Senator Brad Hoylman, State Senator Daniel L. Squadron, Assembly Member Richard N. Gottfried, Council Member Corey Johnson, and former State Senator Tom Duane. Our supporters have very generously offered to match dollar for dollar the first $10,000 we raise for this event. Your support will demonstrate that New York remains a progressive state that believes in equality for all.